Learn how to remove wallpaper without damaging the wall. We also included a list of tools and materials needed as well as costs involved. There are personal and professional reasons to remove wallpaper, but you don’t want to get let down in a ‘do it yourself’ scenario. Without the proper information, things can go wrong. Some people even opt for the easy way out and paint over wallpaper. The only problem with that is you never quite know what is underneath, so painting over wallpaper will just add to the imperfections. Homeowners have a lot of flexibility in the design of their home, so removing wallpaper is a small job that will grant massive creative benefits. Even if this is considered a small upgrade, the sense of accomplishment is well worth the time sink. Before you get started, what are the priorities? Knowing how this will improve (or hurt!) is the first step of the process. Small job or not, it is still a drastic change that affects the way your home looks. One of the easiest home renovations to do for the interior. You don’t need to have a background in decorating in order to take down wallpaper. There are only a few steps, so it can even turn into a family activity. There are a lot of instructional videos online. 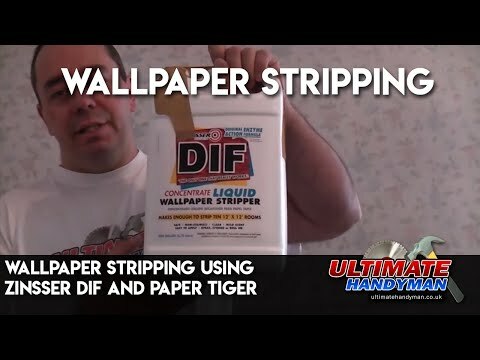 Sites like YouTube have professionals giving lengthy tutorials about removing wallpaper. It’s a good idea to have it up in the background and play the video at intervals where you get confused. Not a lot of money needs to be put upfront for this project. Only a few tools are needed, and there is a good chance you have most of these lying around the house. A short trip to the hardware store is all that’s needed for a few supplies. A single person can do the entire project. It really is that easy, and there are plenty of people that have finished entire homes by themselves. There is a lot of misinformation online about removing wallpaper. These myths are even capable of damaging your walls, putting you in a worse position than when you started. One of those myths that has been hit or miss is the fabric softener trick. Not only does this help, but it can potentially harm drywall. If you mess up by using the wrong information, that specific section goes from being an easy job to being a frustrating one. Home owners have no idea what is underneath the wallpaper until they remove it, unless they are the original owners. Wallpaper has been used to cover imperfections like holes, mold and even structural problems. You have no idea what is waiting for you underneath, and when the wallpaper is removed, you may not be able to repair the imperfection it was covering. Renters may not have the same leeway as homeowners. There is a good chance that if you rent instead of own, then taking down the wallpaper is a violation of the lease agreement. There are a couple of ways you can come at this, but multiple methods still use the same tools. You only need a few tools from the list below, which is fully explained in ‘The Job’ section. 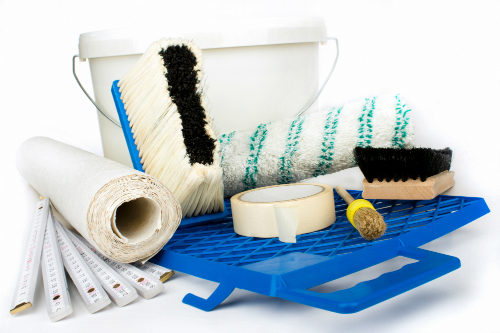 A lot of these tools are already in your home and will be sufficient for getting the project done. Towels, Tarp, Boxes, Covering – This is to protect your floors, furniture and electronics. So if you have a lot of old towels lying around, they will do just fine. Boxes can be cut up and used to cover the floor if none of the other materials are available. The key here is to have less cleanup when the job is finished. Any type of nail puller, even a hammer – Yes, a hammer will do the job if you’re not in a rush. When there are a lot of things to remove from the wall, then it can take a long time. Before you remove wallpaper you have to take down everything on the wall, regardless of how much space it takes. A hammer will do the job just fine, but it is the most ineffective way of removing a nail. Hand Vacuum/Broom and Dustpan – Either one is useful in collecting anything that may drop to the floor after removing wallpaper. Even if you cover the floors, there is a small chance something might get on the baseboards or in other areas. A hand vacuum works best since it can get in tight areas. Wallpaper Stripper Concentrate/Water – Depending on the type of wallpaper, you’ll have to choose between these two to moisten the area. More information about the methods are described later. Scoring Tool/Scraper – Once again, the usefulness of either one of these is going to come down to the type of wallpaper you have. The scraper is easier to get since non-hardware stores are likely to carry it. Paint Brush/Spray Bottle – Use either one of these tools to apply water or the stripper concentrate to the wallpaper. The bottle is the cheaper of the two options and will cover a larger area at once. Steamer – The likelihood of needing a steamer is so low that it is only worthwhile as a rental. When you bring out the steamer, then chances are you have run out of options. There are very few wallpaper removal jobs worth the hassle of bring in the steam, but it is still an option. Start by removing everything from the walls. Even if it is something small like a thumbtack, not removing it will cause problems later on. You don’t want to walk over a thumbtack or nail on the floor after forgetting to remove it from the wall. Next, find out what type of wall you have. There is a good chance it is plaster or drywall, with the latter needing a little more care when removing wallpaper. Plaster sounds solid when you knock on the wall while drywall sounds hollow. Covering furniture is recommended even if you move it. Things can get a little messy when removing wallpaper so it is better to preserve your good furniture. Now this is where things get a little interesting depending on what type of wallpaper you have. This section will give further explanations of the tools mentioned before. Strippable Wallpaper – Wallpaper that has been put up recently is most likely strippable. It can be removed without having to wet the surface. This will be the easiest type of wallpaper to remove, and you’ll be able to take out large chunks without damaging the wall. 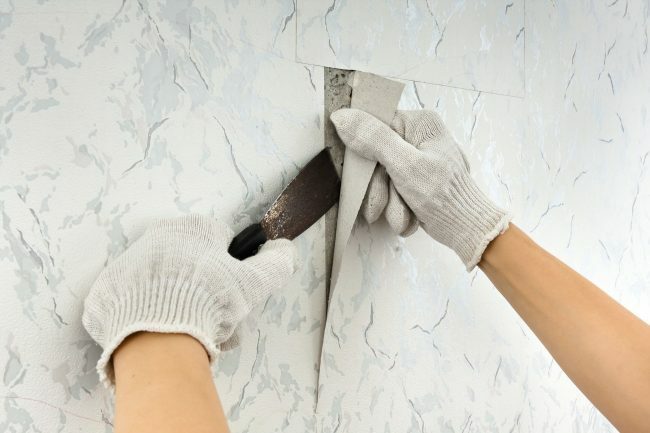 No tools are needed for strippable wallpaper, although you may need to help along stubborn areas by using a butter knife. 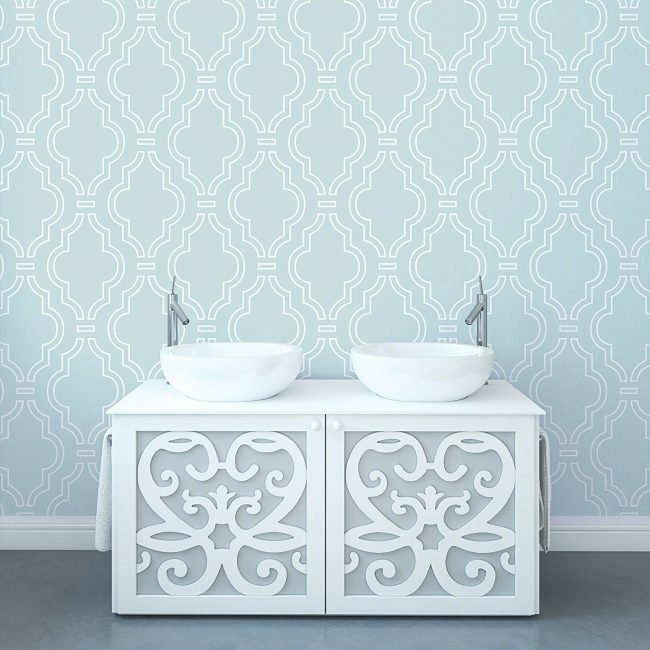 Peelable Wallpaper – The top coat on peelable wallpaper works just like strippable wallpaper. It will come off buttery smooth, but afterwards you have to deal with the backing. Stripper concentrate or hot water is needed to soften up the area. Make sure to apply thoroughly to the wallpaper areas you want to work on. Work and peel rather than working on large areas that dry before you get to them. Washable Wallpaper – Washable wallpaper won’t be a pain to deal with if you approach it correctly from the start. It is harder to remove than other types of wallpaper since you have to get through the plastic film covering the area. This is where the scoring tool will come in handy since it can create large holes in the plastic without damaging the wall. Once you get this out of the way, wet the area with a stripper concentrate. After a few minutes, take to it with a scraper to slowly peel the wallpaper off. Washable wallpaper can be a bit of a pain at first until you get the hang of it. When none of the above methods work for wallpaper, you have to make a big choice about whether rent a steam. Using the steam method requires a minimum of two people, and even then it can cost more than all of the other tools combined. This method is considered brute force, but effective. At this point, it wouldn’t be out of the question to consider covering up the wallpaper with paint. The method is effective and is the same expense as renting a steamer. Now that the hard stuff is out of the way, how much will all of this cost? Since the prices will vary per project, here is a rundown of how much you can expect to spend on typical materials per project. A lot of tools are available in the home already, so it isn’t out of the question for a wallpaper removal project to be free-if you are equipped. The stripping wallpaper project won’t cost you anything if the material is cooperative. Stubborn wallpaper in this category can be dealt with by using a butterknife. For a more effective tool, you can invest in a cheap scraper if needed. – $5-$10. Peelable wallpaper is where you’ll meet a little resistance. Although stripper concentrate is required, you can substitute hot water in its place depending on the age of the material. That alone will save you a few bucks, and it can have a noticeable impact on the price of the project. A 3 in 1 scraper is highly recommended for this project. – $45-$60. As the second most expensive project, washable wallpaper requires just as much patience as it does money. Any type of scraper will do, but the scoring tool is mandatory for the project. Try to get a good scoring tool or else things will get difficult. Washable wallpaper will take the longest out of the three listed projects. – $55-$80. All of the costs listed are assuming you have basic tools like a butter knife, towels and plastic coverings. Basic tools of such low value will only bump up the project price by a few dollars if you need to purchase them separately. How Much Does It Cost To Rent A Steamer? For $35 a day you can rent a steamer, more or less depending on the location. Don’t get surprised by the sizable deposit that needs to go along with that initial amount, sometimes in excess of $100. Steamers are heavy duty machines and should only be handled by individuals with experience. Users should be wary of renting from locations with no reviews. With a deposit that large on a card, it’s better to stick to popular locations with a positive branding. Does It Matter What Type Of Water Is Used In The Bottles? No, as long as it’s hot. Hot water helps with softening up the area so that the wallpaper is easier to remove. Whatever the temperature, make sure that the spray bottle can handle it. Putting boiling water into a cheap spray bottle is a recipe for disaster. And if you have a solution mixed with the hot water, then there is a good chance it will be all over your floor. Try not to reuse cleaning spray bottles that were intended for other purposes. Without knowing how much heat they can handle, it is a risk that isn’t worth taking. Is There A Problem With Using Homemade Solutions? Not necessarily, but it isn’t guaranteed to work properly. Even if it does work, you might put yourself in a situation where it isn’t as strong as branded wallpaper stripper. The good news is that there are a lot of choices for branded versions, so making a home solution isn’t even worth it. 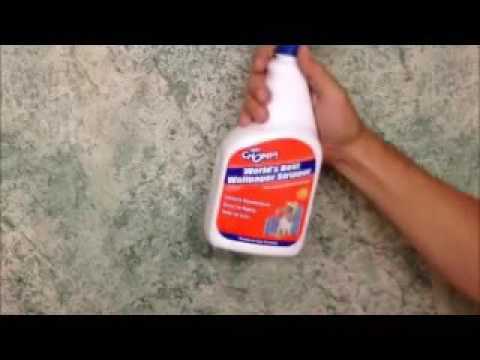 You can purchase cheap wallpaper stripper solutions for as little as $5 and get good results. For the best results, going with a $35+ brand is preferred, but optional. Both the cheap and expensive brands will serve you better than homemade solutions. What Should You Do If There Is A Hole Behind The Wallpaper? 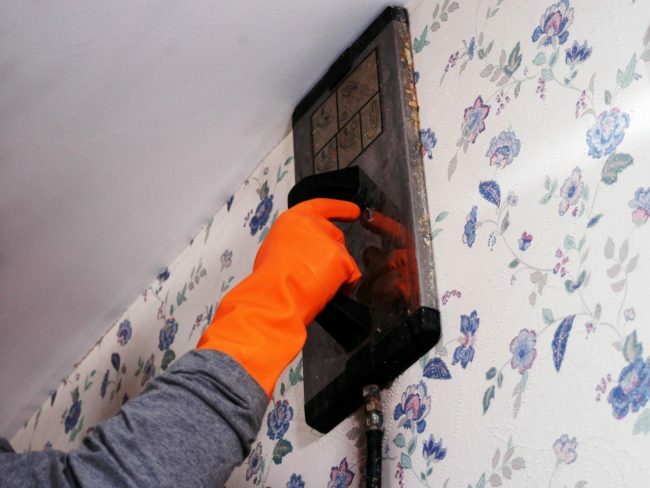 Holes, mold and other structural problems are always going to be a possible downside to removing wallpaper. It’s frustrating to be in the middle of an improvement and then have to switch to repair mode. Projects that don’t take this into consideration will be in for a surprise once the wallpaper comes down. No matter what bad things you find, they are better served repaired than ignored.